The Hootch-Owl Corkscrew , that’s who! …and of course, the fact that it opens bottles of wine quickly and easily. Hoot! In wine, there is wisdom. So who better to open the path to enlightenment than this sage old owl? 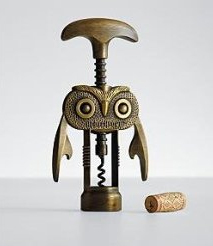 Modeled after the famous hootch owl design from the 1930s, this double-lever corkscrew is as powerful as it is charming. The wings feature bottle openers, making it a multi-functioning tool for every bar. Exclusively from RedEnvelope.